Detour . . . . not sure where these dogs came from, but they took our seats whilst we were all off scrappin', swimming, sleeping or eating!!! This looks great.... very clever idea! Hey - if the Snow Dogs are here, where's Cuba Gooding Jr? Oh, my goodness! What a great photo, Kerry! Good one! Any idea when we'll be able to use the chairs again? 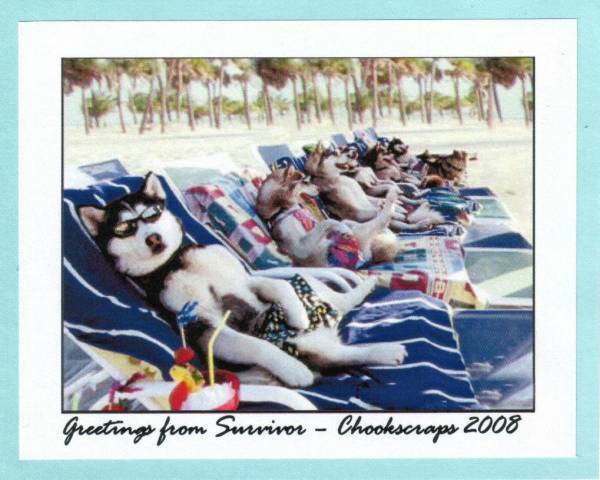 I love this postcard, it is so cute! Oh no - I am meant to be on a scrapping hoilday who brought my dogs along??? Now I will have to pick dog hair out of my cocktails. Seriously I love them and this postcard!!! Fantastic, love the dogs. They know how to live the life. Who let the dogs out?!? Love the photo! Hehehe! As long as those dogs don't bark so I can scrap in peace then all will be ok!! !